The California roll is one of the most favored sushi rolls and has been credited with popularizing sushi in the United States. 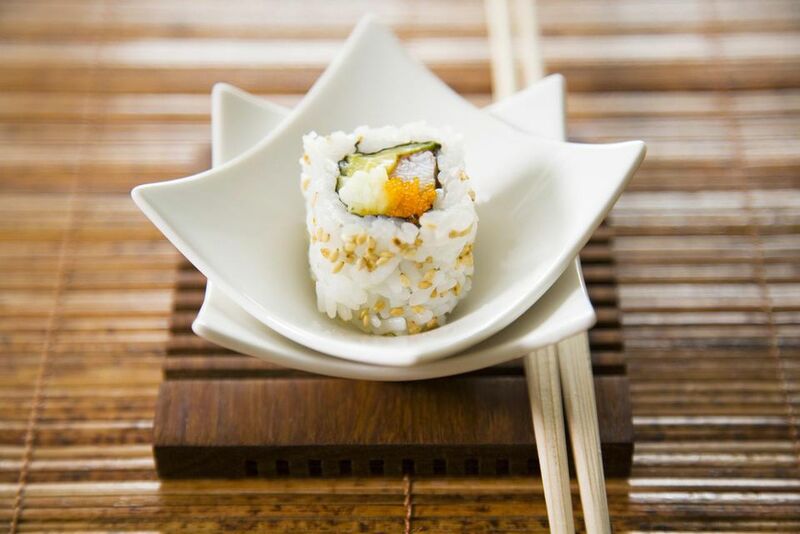 California rolls are usually made inside-out – rice on the outside, nori (seaweed) on the inside – making them easier to eat. The center is studded with crab meat or imitation crab, cucumber, and avocado. There is some debate as to where the California roll was invented. Most people believe that a sushi chef at a Little Tokyo restaurant in Los Angeles came up with the idea. However, a Canadian sushi chef takes the credit, claiming he named the roll "California" due to its popularity with Southern Californian guests. You will need a bamboo mat to roll the sushi, which is found at Asian markets as well as some supermarkets. The technique for rolling sushi isn't difficult but may take a little practice. Once you master it, you will be able to create any type of sushi you like. Halve avocado. Using the end closest to the handle of the knife, swiftly wedge the blade into the pit; turn knife with pit slightly and pull out. Using the tip of the knife, slice avocado halves vertically and then once horizontally down the middle. Scoop out the sliced halves using a spoon. Alternatively, you can scoop out whole halves and then mash the avocado. Tear imitation crab into pieces and place in a bowl; season with mayonnaise and salt. Cut cucumber into 1-inch-long julienne. Cover a bamboo rolling mat with plastic wrap. Put a sheet of dried seaweed on top of the plastic. Spread 1/4 of sushi rice on top of the nori sheet. Sprinkle sesame seeds over the sushi rice. Using the plastic wrap, turn the sushi layer over so that the seaweed is on top. Remove the plastic wrap and place avocado, crab and cucumber horizontally on the seaweed. Roll the bamboo mat toward you, pressing the ingredients inside the cylinder-shaped sushi. When finished rolling, press firmly on the bamboo mat with hands, unroll the mat and then remove the rolled sushi. Repeat to make more rolls. Wipe a knife with a wet cloth before slicing sushi. Cut the sushi roll into bite-size pieces.